Shiva one of the three major Hindu deities. Shiva has 108 names, but is commonly referred to as “the Destroyer” or “the Transformer”He is considered the Supreme God within Shaivism, one of the three most influential denominations in Hinduism. Shiva is as an omniscient yogi, who lives an ascetic life on Mount Kailash, spending much of his time in meditation trance. Shiva also has a wife – Parvati, and two sons Ganesha and Kartikeya. Shiva is often depicted as immersed in deep meditation, with his wife and children or as the Cosmic Dancer. 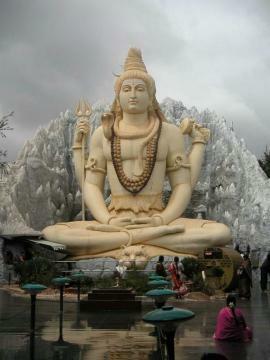 “Lord Shiva has two aspects. In one aspect he is all compassion. In this aspect, it is easier to satisfy him than the other gods. It takes a long time to please the other cosmic gods, but when you want to please Shiva, you can do so much more easily. There is a special leaf in India. If you use that particular leaf to worship him, then he is satisfied. He is very simple. His whole body is covered with ashes. He remains trance-bound. 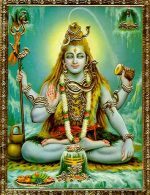 This is Lord Shiva in one aspect. His other aspect I call his transformer aspect. It is absolutely the right description, but according to the Indian traditional way, it is the destroyer aspect. He dances his thunder-dance of destruction. When he sees that the world is corrupted, he destroys it with his cosmic dance. This dance of destruction is actually the dance of purification and transformation.